The final run for Ninja Steel episodes started out not bad but would soon change. Though it was weird how the Rangers needed to earn the Blaze zords before the Prism would create them, I liked how they worked in the mysterious cloaked strangers (Wes, Gemma and Koda) as a teaser right before "DIMENSIONS IN DANGER" (or as I like to call it, "Forever Tommy"). Great callback to DinoThunder with Reefside and Tommy's house. I was amazed seeing him use all his powers and how they got all the morph calls perfect (Probably more JDFs doing than Production). 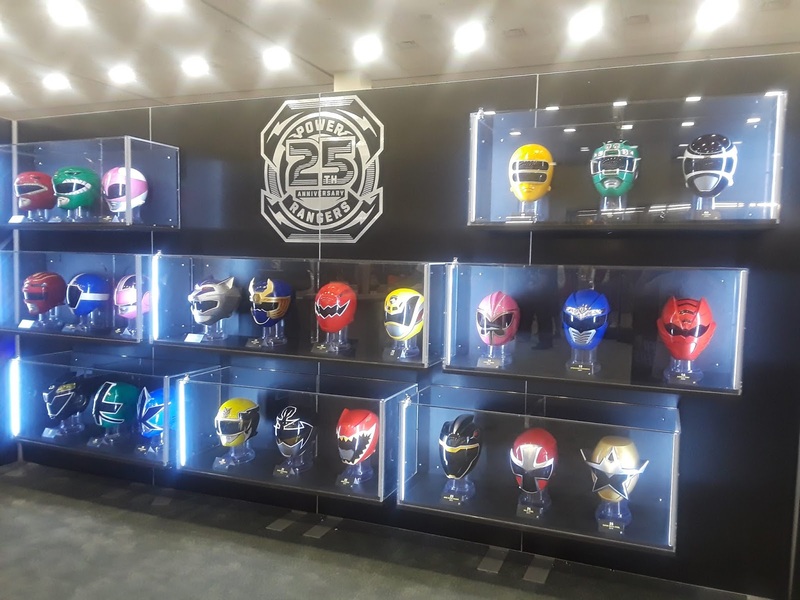 Gotta wonder if Zeo Red and Black Dino Master Morpher Power Coins will be for sale at the next PMC. With only one part, a little too much Ninninger footage and a fast battle, it wasn't great for an anniversary special. They didn't even acknowledge that Tommy and Kat were an item (let alone really give them anything together), which I was kind of surprised by. And aside from the zord portion of the episode, they reverted back on the BGM (before they went full MMPR ripoff), I assumed for dramatic effect. The stuff they gave Tommy was still better than just about all of the regular episodes, so for that, the most deserving 5/5 of Ninja Steel. I'd rank it between "ONCE A RANGER" and "LEGENDARY BATTLE" (the worst). Following that we got the best filler episode of the entire two years in "LOVE STINGS" - classic love spell plot with Hayley and Preston actually acting like normal people with solid delivery - something Ninja Steel often struggled with. And speaking of struggling, it was pretty much back downhill after this with questionable plot points, execution of the episodes lesson and Victory & Monty getting completely ridiculous. They also manage to blow a chance at doing a good Metal Hero teamup with Sherriff Skyfire in a weird episode about respecting authority. And despite reusing the Halloween Intergalactic Court from Dino Super Charge, I enjoyed "MONSTER MIX-UP" and thought the cast did a great job pretending to be the monsters. Getting to the finale, I liked Odius' final plan brainwashing civilians and using Mick to help her but the execution was poor leaving little reason to care. The Rangers find out the plan way too easily through simple eavesdropping. I did like evil Dane vs Brody & Levi for a minute while Hayley faces an evil (and unconvincing) Calvin, who of course is able to take out the satellite in one blast. The final battle needed some buffering such as trying to use Lion Fire first than to quickly conclude there was no point. And once Odius is gone, the Rangers just assume everything is fine, completely ignoring Badonna & Cosmo, who for being Generals, are killed off with very little thought. I just wish they had done more with Cosmo, besides when he came to Earth in "GRAVE ROBBER." The Prism then takes back the power stars only to return them A THIRD TIME in "THE POISY SHOW" - a rather decent end to the Neo Saban era with Poisandra turning Galaxy Warriors into her own talk show with a Christmas special featuring the Rangers while Sledge teams up with Snowfright. We finally get the Sudarso Bro moment with the guys doing the classic morph pose and one last bomb takes out Sledge, Poisandra, Wrench and the entire Warrior Dome for good. Dino Charge was the only real good thing to come out of Neo Saban (especially the first half) in what was otherwise the worst seasons of PR ever. I still gotta call Samurai and its bad start to Neo Saban the worst season, though ironically, also the best finale and end-of-season-arc (mainly due to translating Shinkenger) but it was sure rough getting there with little originality and childlike acting. Ninja Steel is next which had problems other seasons didn't... Some of the worst episode plots and plot execution ever... Refusing to have any genuine conflict... Ridiculous over-the-top comedy... An atrocious amount of closure... Kind of makes Megaforce look a little better now which had one of the best casts, one of the best midseason cliffhangers with the Armada arriving, a better school setting and plots, but still relied on too much sentai over originality, completely screwed the buildup to the Legendary Battle, and what could've been a good season long tribute to the PR legacy. I've reminisced about 1998 and my time at Roosevelt you can still find here and here via LiveJournal. Now here we are again, celebrating '98 with the 20th anniversary of graduation and a nice visit back at the school, part of reunion day. Simply put, high school was mostly pretty well for me and Senior Year was the cumulation of it all . I can't say much for Freshmen Year, just that it started out slow not really knowing anyone, except for rejoining Ting (who was a year ahead of me), after 7th grade at Eckstein. I had a Home Ec class I never did much work in and I was probably pretty happy to quickly get out of P.E. entirely (which I did have 6th - 8th grade). Sophomore Year I joined the school store (Teddy's Corner) which moved to a bigger space (after basically being the space of broom closet) and we started selling balloons. Ting and I had a ceramics class and all I did were small bowls (which I still have!) The teacher had a radio and Real McCoy's "Another Night" would often come on, which I'd say pretty much introduced me to the entire genre of dance music. We also had a radio on sometimes in 5th period and at some point I got introduced to C89.5 FM "Seattle's Hottest Music" (now "Seattle Home For Dance"). I then did a work training program over the summer of 1997, helping out the custodians at Nathan Hale High School (where C89 is located). Right around my last day, I got a quick tour of the old second floor studios. I still have fond memories of listening to the station during my walk home from Nathan Hale, as well as a keepsake binder covered in C89 stickers I found one day in the recycling room, in addition to the photos from my visit. Junior Year pretty much continued the Ting and I duo, helping out with Teddy's Corner and then having 5th & 6th periods at Nathan Hale's Print Shop, as part of the VOTIS program. Ms. Fernandez (who was in charge of the store), was a very nice lady who took a group of us on a field trip to the Space Needle for lunch one day. Senior Year I didn't continue with the store and Ting had graduated. Though it was fun having one school year with my sister Sarah, who I'd occasionally see with friends in the hall. Also I liked getting to sleep a bit later having no first period, but it took awhile to figure out a second period for me. And once we did I ended up not even liking it because it was just too advanced (It was Advanced Drawing & Painting after all). To this day, I still remember successfully getting one of the art projects done and then watching the teacher roll her eyes as I handed it in. Of course, Senior Projects were the big thing, which I've talked about. In some awful timing, I was late for school the day we needed to turn in the big presentation boards. The night before, as I was getting all set for the morning, the police forced a neighborhood evacuation due to a standoff involving someone with a gun up the driveway from us. I remember pretty much just sleeping in the car with Sarah, mom and dad at the top of the street until probably 2 or 3 am. Also, I was still in the VOTIS program (again taking up the last two periods), with one more semester at the Print Shop and then working at the downtown A&S Center second semester. Finally, the end of high school came and I made sure to get a bunch of photos and as many yearbook signatures as I could, great to look back on today. And as I've talked about, a fitting end with a wonderful Senior Spree. Not real sure where I'd be the following year, I then enjoyed a very long, lazy summer, often up, chatting on AOL and listening to C89 until 3 or 4 am, consistently starting the day in the afternoon. A lot of time to watch MTV and a lot was on... The original Real World Seattle, Road Rules All-Stars - the very beginning of what would become The Real World/Road Rules Challenge, plus the debut of Total Request in a new primetime block, which soon became the TRL afternoon countdown. Earlier in the year, Road Rules Northern Trail did a Seattle episode featuring Third Eye Blind which I thought was the coolest thing. 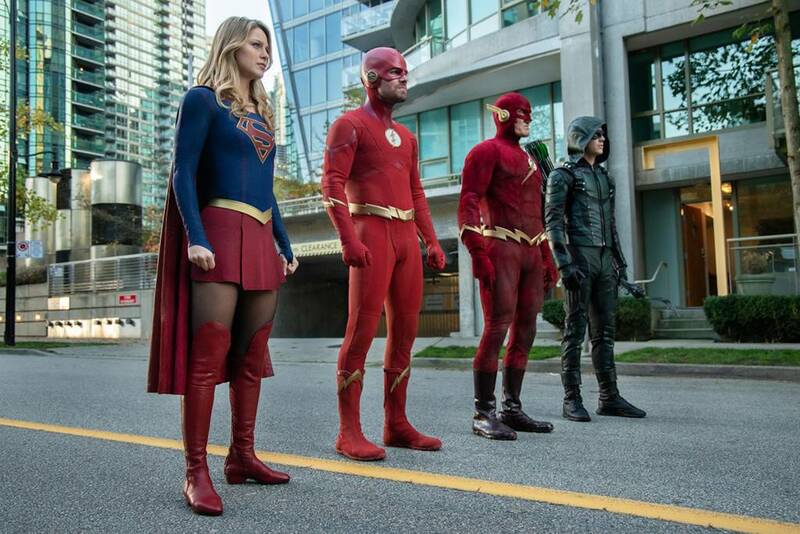 The TV landscape was of course very different, unlike today with Netflix Originals, reboots and The CW's Superhero TV. Besides MTV, my favorite show was definitely Buffy the Vampire Slayer and I immediately loved That '70s Show when it premiered in August. This was also when I really started to catch up on Mighty Morphin Power Rangers afternoon reruns, while the current season (Power Rangers in Space) would end the first six years with a truly morphinominal finale in November. Meanwhile, October 4 was my first day in a work program at Seattle Central Community College, mostly doing recycling, mail delivery and some shipping/receiving, lasting until winter break mid-December. I also had meetings with a job coach there who helped get me a job at a printing place, which I started at mid-January. I'd go on to spend 4 years at MasterPress, which ultimately suffered from the economy and major staff cuts but is still open to this day. And besides my first real job, it was my first real experience having friends at a workplace, long before Whole Foods and QFC. Unlike a lot of my classmate friends who I'd say moved on after graduation and never really looked back (not interested in any reunions either if this year is any indication), I wasn't quite ready to say goodbye to Roosevelt so fast. In June, I went with mom & dad to see the '99 spring musical ("Oklahoma!") and once in awhile, I'd see someone I knew while I'd be on the bus or about to catch one. Went to a Roosevelt football game in October and the following June, went back once more to see the '00 musical ("Brigadoon.") Also, Ms. Shintaffer & her husband had a boat and would take a small group of her students out sailing. We went once every June between '97 - '00. I enjoyed getting the chance to see the '99, '00 and '01 yearbooks as well whenever Sarah or one of her friends had left one around. She used to host parties, and July 26, 1999 was the biggest one of them all with what felt like almost the entire Roosevelt student body at the house, along with some graduates and other friends of Sarah's friends. It also became a sort of after party for a bunch of girls who had attended the Britney Spears show downtown and was finally broken up late in the night when the police arrived. These are the moments I can't ever forget. So here's to Roosevelt High School, my 4 years and all the celeb alumni who have walked the halls. 96 years (with a major facelift) has never looked so good. I like watching these Disney era seasons again several years later (In this case it had been a bit over 11 years since Mystic Force aired). I remembered it as being not that good, a common theme I'd say from around mid-SPD through late in Jungle Fury. Back then, it was fun to pick on the shows flaws (and listen to Rangercast do so), which led me to start blogging about every episode, which you can find here. But that was then. Now I appreciate Mystic Force a lot more. The magic theme and Underworld really worked for me and the backstory of the great war that took place was fun to see again, which I now highly regard as the best structured story of the Kalish seasons (To this day, the only magic based season of Power Rangers). We had some good episodes adapting Magiranger footage which I loved (most notably "THE GATEKEEPER," "HEIR APPARENT" and "LIGHT SOURCE" two-parters). The humor was handled good too with Phineas and Clare doing most of it (Oh how I miss that today). 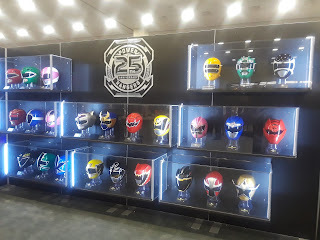 Looking back, I kind of think of it as a precursor to Super Megaforce using Gokaiger. This season also gave us one of my favorite Green Rangers (Xander) and a fun guy in Chip (Yellow). I liked having John Tui back right after SPD as Daggeron, and Barnie Duncan playing Toby (and doing a brief Piggy cameo from SPD) was awesome. 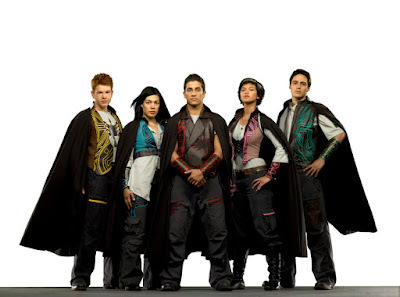 Mystic Force still had some glaring problems... Nick, one of the worst Red Rangers of the shows history helped contribute to a bit of a downturn in the second half as he really got a lot of the focus, as well as how they kind of rushed through The Ten Terrors. Vida (Pink) was also pretty bad (especially early on), while Madison (Blue) just never got much focus. This season also infamously dropped the ball by making what many thought was a different show than what the premiere trailer looked like. After the premiere, the forest creatures weren't seen again until the finale, which had a laughable final battle with the seasons big bad getting overstuffed on magic to defeat him. They went a little too far with all the revivals as well, I thought. The flaws are only part of an otherwise good story and while there are several seasons better, we've seen a lot worse over the years since. In 21 seasons (season 1 - Ninja Steel) I'd rank Mystic Force right in the middle.